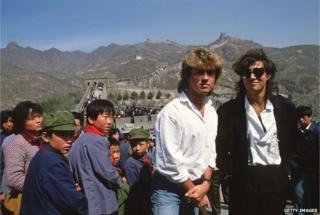 When China woke up to Wham! Everyone who went to see Wham! perform in China in 1985 seems to remember the same details: the dazzling lights, the overwhelming wave of noise when the music began, and the outfits worn by the duo, George Michael and Andrew Ridgeley. In 1985, China was just opening up to the outside world following the tumultuous Cultural Revolution. At the same time, Wham! were eager to prove that they were the world's biggest pop band. A concert in China was just the ticket. The duo's manager, Simon Napier-Bell, tried to convince various Chinese officials over lunch that the concert tour was a good idea. His successful sales pitch hinged on how China would appear to the outside world if George Michael and Andrew Ridgeley were allowed to play. Wham! 's presence would be proof, Mr Napier-Bell reasoned, of the Communist Party's desire to welcome foreigners, and much-needed foreign investment. The pitch worked. Two weeks after the Chinese government gave the green light, Wham! were due to perform in Beijing and the southern city of Guangzhou in April 1985. The duo were set to become the first Western band to play inside China, beating other hopefuls Queen and the Rolling Stones. "One day, I saw the concert announcement posted on a wall," remembers Li Shizhong from Beijing. He was just a teenager at the time. "The band members had long curly hair. They dressed differently. I thought their music would sound different and new because they looked so different from anything else I had seen before." "But I couldn't go to see them," he sighs, "because I couldn't ask my parents for 5 yuan ($0.80, £0.54) to pay for the ticket. My parents wouldn't support anything like that." "We didn't have a nightlife. I was a 15-year-old boy but I had to stay at home after 8.30pm." "The rigid social atmosphere back then was the real reason I couldn't go to the concert. At that time, if you played a guitar on the street, you would be considered a hooligan." "I only had blue, green and grey Cultural Revolution style clothes. If someone dressed in a different colour, everyone would notice. Now we think that's fashionable, but back then, something like that signalled trouble." Many of the tickets were passed to Chinese government officials. "I went to see it because my classmate's father worked for the Ministry of Culture and I was given a free ticket," Lin Wenjun from Guangzhou remembers. "Not many people knew about them at the time but I listened to their music on Hong Kong radio, which wasn't blocked back then." "It seemed that most of the audience received free tickets because they seemed old. They didn't dress like music lovers," he mused. "Before that day, I had only seen a ballet performance. So the concert was a shocking experience because of all the lights and the stereo sound." "I wanted to sing along with the lyrics but I didn't dare because no-one else in the audience was singing." Even those involved in the concert were astonished by the newness of it all. Now a famous Chinese television presenter, Kan Lijun served as the on-stage host at Wham! 's concert in Beijing 30 years ago. She introduced George Michael and Andrew Ridgeley to their slightly befuddled audience. She then stood backstage, watching the concert. "No-one had ever seen anything like that before," she said. "The singers were all moving a lot and it was very loud. We were used to people who stood still when they performed." "All the young people were amazed and everybody was tapping their feet. Of course the police weren't happy and they were scared there would be riots. One time, people were excited after a sports event and they flipped a car." Before Wham! appeared, many kinds of music were forbidden. "Back then, if we wanted to listen to pop music with lyrics like that, we had to do that in secret," Ms Kan remembers. "If you were caught, you would be taken to the police station and they would keep you there all night. It was a time of many taboos." Compete with the sky to go high, high. Women are on the same journey and will not fall behind. A cassette tape featuring Wham! 's songs on one side, and Cheng Fangyuan's Chinese covers on the other, was handed to each concertgoer. Lin Wenjun received a cassette when he attended the concert in Guangzhou, but he sold it to his classmate afterward for 20 yuan, a small fortune at the time. For others, that cassette remains a prized possession. "Some of my classmates went and gave the tape to me as a gift," remembers Li Shizhong, the Beijinger who was not able to attend the concert. "I still have it." "I'm really grateful they came to China and I want to salute them," he continues. "That concert was so meaningful to us."